Why would he go there? Why in the name of all things bright and beautiful would Mitt Romney spend an hour or two in the heart of West Philadelphia? I realize that Pennsylvania is a crucial swing state, but Romney hasn’t even got a puncher’s chance of gaining any serious votes from inner-city Philly. The man couldn’t win Philadelphia County if he chose Allen Iverson as his running mate1. So why would the Romney campaign think it prudent to visit the Universal Bluford Charter School? Well, for the past two decades, charter schools have been at the forefront of the GOP’s brave new world. It’s a really a marvelous place where tax payer dollars aren’t spent by the fumbling, corrupt hands of big government, but are in the capable and benevolent hands of private enterprise. And, in this utopian future, teachers and (more importantly) administrators aren’t beholden to all of those pesky barriers like public accountability or the rights of the student body. At it’s heart is the core belief held by charter school proponents that all areas of government, including education, should be run as if it were a private enterprise. Of course, private companies could do a much better job of educating our young’uns than the state could. I mean, these are the titans of industry who recently had to be bailed out by the American taxpayer to the tune of…hold on…carry the two, divide by pi…about 2.5 trillion dollars thus far. It’s not like private industry caused the greatest recession since the Harding administration by selling houses to people who never could’ve afforded them and re-packaging them as sound investments to international investors. These guys would do great at educating America’s youth, that is if the entire budget wasn’t traded away by some rogue European investor named after a sea mammal. 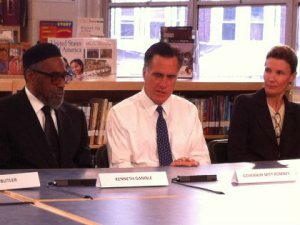 So, who’s captaining the charter school that Romney visited in West Philly? Well, they’re so modest that they only stuck their name at the front of the school’s title. Universal Companies, a Philly non-profit involved in a host of activities, prime among them real estate development and education. As the company’s website so aptly puts it (parenthetical statements mine), their company is, “in the business of helping people (provided said people live in neighborhoods with desirable property and assets)” and aims to “stimulate the development of wealth within (gentrify the hell out of) historically disenfranchised communities (poor, predominantly black neighborhoods)”. Now, if you think I’m being unreasonably pessimistic and unfair to this “non-profit,” let me go over with you what some of the stated strategies of their universal plan are, and what those strategies mean in terms of socioeconomic reality. Target communities that are at the point of transition, between decline and the pressure of residential reinvestment. This is essentially what investment firms like Romney’s former company Bain Capital do as their business model. The key phrase here is “point of transition”. In this case, Universal Companies identifies a neighborhood or area that is at said point, where the land still has potential market value but is at their nadir in terms of property value and they buy up the property with the intention of fixing it up and flipping it for monetary gain. This is very sound business practice, but flips the bird to the previous residents of the neighborhood who can no longer afford to live there. Aggregate land and create a portfolio of affordable and market-rate developments to complement the increasing private investment in the community. A non-profit buying properties left and right and building them up is no good if other for-profit investors and businesses don’t jump on the bandwagon as well. There’s almost a critical mass at which neighborhoods go from being “ghettos” and “dangerous” to being “bohemian” and “chic”. You can feel it if you’ve lived in or around the neighborhood for a long time. My general litmus test for these types of things is the “what did that used to be test”. Basically, it is how it sounds. You go up to 10-15 people on the street or at a bar and point out an older building that has clearly changed owners and ask each person if they know what used to be there before. If less than half of the people you ask know or at least have an educated guess about it, then your neighborhood is becoming gentrified. Foster local community capacity to take advantage of market change. Here’s the rub. This is 100%, unadulterated bull-hooey. And I don’t say that because it’s not an admirable goal, which it is, but because it is impossible. Universal Companies and others of their ilk know that it is impossible, yet they say it anyway because it’s altruistic and makes their mission statement look better. It is the market change that takes advantage of the local community and not the other way around. These are the people that own the charter school that Mitt Romney visited in West Philadelphia. And it is with that in mind that you should read between the lines of Romney’s claims that class sizes have no effect on student performance. This is not about effectiveness, but it is about overhead. Whether you’re involved in public, charter or private schooling, it is convenient and profitable for administrators to believe that hiring fewer teachers and paying less money in salaries is good for students. When private enterprise gets involved in public institutions, negligence ensues. Ask anyone who has ever had the misfortune of doing time in a private prison. The Corrections Corporation of America didn’t get a stock price of $26/share by giving comprehensive and effective care to their clients. They did it by hiring non-union, untrained staff and paying them a pittance to save money while cutting valuable therapeutic programs. This is where the charter school is headed. This is why a study conducted by the Center for Research on Education Outcomes at Stanford reported that 83% of charter schools did the same or worse as their public counterparts. There’s a reason why teachers at charter schools are less likely to meet state accreditation standards and more likely to leave. It’s not innovation. It’s just business.